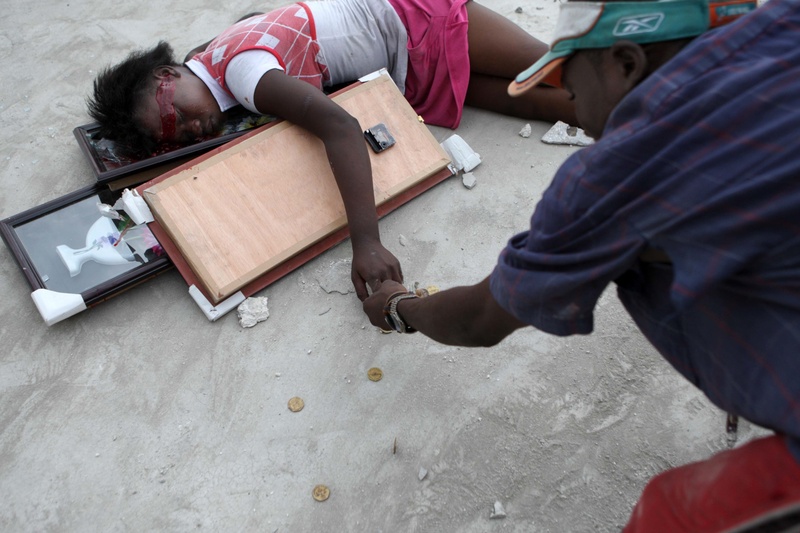 PART TEN IN A SERIES OF POSTS DISCUSSING PHOTOGRAPHERS’ ACTIONS AND RESPONSES TO THE KILLING OF FABIENNE CHERISMA IN PORT-AU-PRINCE, HAITI ON THE 19TH JANUARY 2010. James Oatway is a Johannesburg based photojournalist employed at the South African Sunday Times. 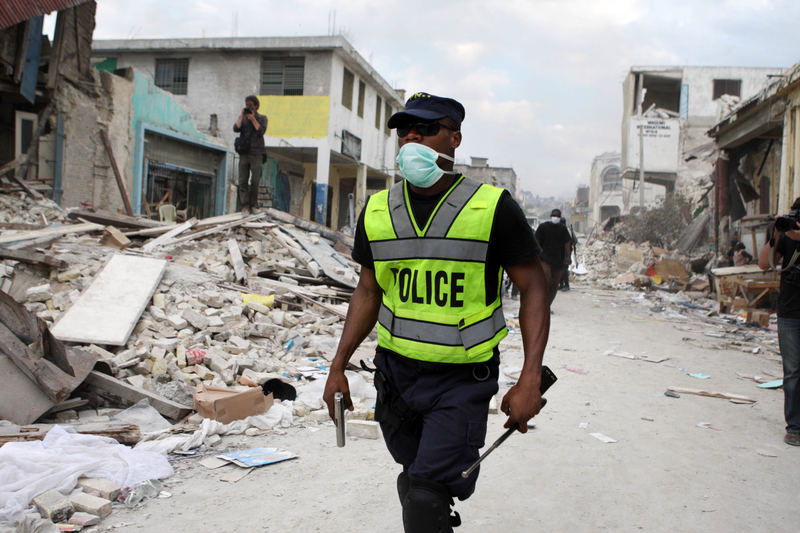 James was in Haiti from January 17th until January 28th. On the morning of the 20th – the day after the shooting James’ diary dispatch for the SA Sunday Times was published. Earlier that day, not far from where [Fabienne was shot] I had seen a young man taking his last breaths. He had been stabbed in the neck and chest by fellow looters in a fight over a box of toothbrushes. People were stepping over the dying man. Then about five minutes later some men stopped and put his body onto a motorbike and took him away. I was about two meters away from the policeman when he fired the fatal shots. He was behind me and fired two quick shots. Not knowing that anyone had been struck I spun around and photographed him gun in hand. Police were arresting a man on the street corner. I photographed that for about thirty seconds and then someone shouted that someone had been shot. I ran to where she lay on top of those frames. She didn’t have plastic chairs with her as some reports claimed. How many other photographers/reporters did you see at the scene? There were initially about five or six photographers there. While we were shooting a man came and took money out of her hand. I shot for about fifteen minutes. Word must have got out about the shooting because more and more photographers arrived. Do you know the photographers’ names? I only knew two other photographers names… Jan Dago and Jan Grarup. Both Danish. Then about twenty minutes later the father and brother arrived. The father was already hysterical. I followed him onto the roof. He lifted her head up and then realized that it was his daughter and dropped her again. Then he and his son began carrying her away. It was at least three kilometers and there were many stops. Her sister and other family members joined the procession. There was a lot of screaming and wailing. I withdrew at this point. There were too many photographers … and I became emotional. I had also stood on a nail which had gone deep into my foot. There must have been about fifteen photographers. There was a bit of jostling but nothing too bad or disrespectful. I have her surname as “Geismar”. I have no reason to doubt my fixer who I saw write it down in his notebook. I will stick to Geismar as being her correct surname. Prison Photography has consistently used Cherisma, the spelling used by The Guardian on its first dispatch following her death. Elsewhere, I have seen the spellings ‘Geismar’ and ‘Geichmar’. Likewise, Fabienne’s father is referred to as both Osam and Osama, and sometimes both in the same publication. Fabienne’s mother has been named Armante, Armand and Amand Clecy in the reporting of different media.